Covers and locks air valve levers on truck to prevent the truck and trailer brakes from being released. Constructed of thermoformed, high impact resistant Polycarbonate material, the AirCuff® completely covers and locks the dash mounted air valve levers to prevent the truck and trailer brakes from being released. The unit is portable and easy to install with no drilling or permanent installation parts required. Air Cuff Lock #3000 fits most trucks. 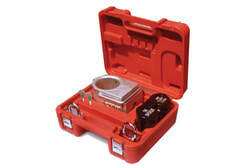 Air Cuff Lock #3030 fits International ProStar trucks.